Catelin Mathers-Suter’s “Overgrown I’’ shows the square outlines of buildings beneath a carpet of greenery. Catelin Mathers-Suter is one of those artists who captivate with a mind-boggling attention to detail. For her show at Kingston Gallery, she draws landscapes in ink, delineating even blades of grass. But there’s more going on in her work than obsessive detail; in fact, she often leaves areas completely blank, and her scenes sometimes diminish to the sparest of lines in the distance. Mathers-Suter layers landscapes. Using grid stencils, she superimposes renderings of man-made spaces over more natural ones. But the geometry of the man-made structures is merely suggested because she draws them only in negative space, often making solid structures into voids. Leaves, grass, and blossoms flourish over pale hints of the built environment. Our habit is to see a building and ignore the land around it; it’s a simple figure-ground equation. Mathers-Suter compellingly inverts that formula, creating satisfyingly enigmatic works of art. In “Poles,’’ foliage creeps up and lolls across empty white verticals. They might be utility poles lining a road, receding into the background. They bring a sense of order to the scene, but it’s a frail, ghostly order. 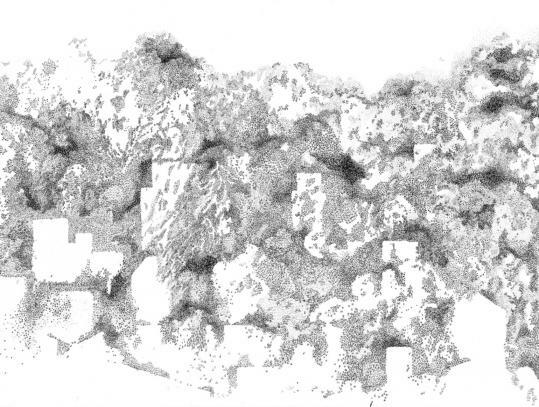 “Overgrown I’’ shows the square outlines of buildings beneath a carpet of greenery. There’s a clear block pattern; in places, the verdure gives way to sheer, empty squares. Mathers-Suter draws the viewer in with her minutely attentive hand. It’s not until we’re in deep that we notice that she’s pulled us into a dissonant, otherworldly environment. Also at Kingston, Karen Meninno’s installation “Confections of a Baroque Mind’’ is a table covered with bright, tiny clay sculptures in a hot rainbow of tones, from fuchsia to purple to orange. It’s giddily over the top - she mentions Marie Antoinette in her discursive artist’s statement - but strangely, it left me wanting more. A tabletop of visual pastries is not enough for an art installation. Fill a room with them. Keita Sugiura’s dark, luscious photographs at Keiko Gallery take time to appreciate. At first, they appear simply black. Let your eye adjust, and you will see a forest landscape. The young Japanese photographer takes a large-format camera into a forest at sundown. He shoots in the shadows at dusk. Instead of printing on photographic paper, Sugiura scans his film and makes prints using a mineral ink with an alluring velvety finish that seems to absorb light, making the shadows even blacker. The forest pops dimly out of this blackness in cool, watery green, but pop it does, thanks to the high-focus detail the large-format camera captures. In “Black Forest: Acts of Reverence #5,’’ all those details of grass and leaf stir from the darkness, as the eye brings them into clarity. The print looks almost like a negative image, with solid forms imbued with a pale glow against the darkness. “Black Forest: Acts of Reverence #1’’ is crisscrossed at the bottom by slender lines - perhaps fallen bamboo? - resembling hay flattened by a hard rain. Leaves rise up a hill above them, over an arcing vertical chasm of shadow. Tonally spare, texturally rich, these images have a tang of abstraction about them. But like dreams rising from the unconscious, they are what you make of them, and they are full of possibility. The bulk of the two exhibits put together by Jane Ingram Allen at Boston Sculptors Gallery goes to the group show she has organized of works by the gallery’s members. Allen’s own handmade-paper works, which focus on issues of drought and water conservation, fill the gallery’s foyer. Her piece “No Water’’ is a large curtain of reddish sheets of paper coalescing into the form of a footprint. Allen made it from plants she gathered in Tanzania, to call attention to drought in that country. The footprint, she explains in a statement, alludes to how human actions have precipitated weather problems around the world. Her works are lovely and ethereal without explanation; their green agenda, explicitly spelled out in her statement, can ascribe too much meaning to them and rob the viewer of a personal response. “Transformers,’’ the group show, focuses on work about change - not necessarily climate change or political action, but something as subtle as a shift in perception. Highlights include Eric Sealine’s diorama “Looking Glass,’’ which invites the viewer to peer through a lens and see the scene in a new configuration, and Andy Zimmermann’s dioramas, made with mirrors and more behind frosted plexiglass, which change as you walk past. Zimmermann also contributed “Pflanze,’’ a series of steel rods outfitted with leaves, set in groups upon what look like components from a stereo speaker; as you walk by, they hum eerily. Mary Sherman’s spare, suggestive “Taipei’’ is an urban landscape made of moveable pieces. Hannah Verlin’s “Wishing Well’’ fits neatly with Allen’s water theme: It features mason jars half-filled with water, each labeled with a wish (“I wish I could fly,’’ “I wish I had a better job’’). Viewers are invited to drop coins in. Many have.